As France’s labor minister, and its wealthiest Cabinet member, Muriel Pénicaud has been handed the reins to carry out the divisive task of overhauling France’s famously voluminous labor code. PARIS — Muriel Pénicaud is the sort of figure that French protesters love to bash. A former human resources executive. A tenacious negotiator who wrangles with unions. And a friend to business leaders and political elites. There may soon be more that draws their objections. As France’s labor minister, and its wealthiest Cabinet member, Pénicaud has been handed the reins to carry out the divisive task of overhauling France’s famously voluminous labor code. In a country where union-led demonstrations have often forced governments to roll back economic reform plans, that is proving no easy job. Previous positions: More than 20 years as a human resources executive at Danone and Dassault Systèmes, then head of the government agency Business France. The campaign to renew the French economy, one of President Emmanuel Macron’s flagship policies, involves steering toward a Nordic-style labor model known as “flexible security.” The changes aim to rebalance the welfare state by creating more flexibility for companies to hire and fire, while offering greater training and support to help workers transition to new jobs. Pénicaud has been pivotal to ushering in such changes. Over the last year, she has taken an ax to some of the most cherished parts of the 3,300-page rule book in the name of remaking French capitalism. Chief was decentralizing industrywide collective bargaining agreements, once thought to be untouchable, and allowing companies to reach their own deals with workers. Now, she is negotiating the next phase of “Flexicurity à la francais”: An overhaul of the nation’s inefficient skills training programs, as well as a recast of unemployment programs to expand benefits to self-employed entrepreneurs and tighten controls on job seekers. Such actions have unsettled detractors who accuse her — and Macron — of caring less about workers than business. Critics say she is out of touch with ordinary workers, and she has been dogged by an investigation over her involvement in a lucrative no-bid government contract. Pénicaud insists she is fighting to overcome hurdles to what Macron has called make-or-break changes for France. 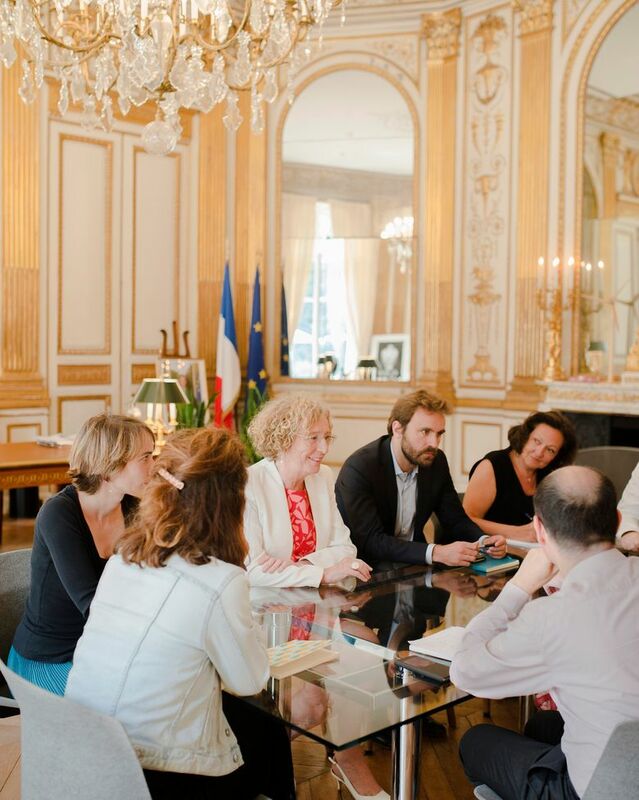 To secure the business-friendly updates to the labor code, for instance, she conducted a 300-hour negotiating blitz with the heads of France’s major unions and leading business groups. Unlike Scandinavia, where government dialogue with social partners tends to be smooth, the relationship in France is more confrontational. So she insisted on meeting with each group individually to forge relationships and consensus, and swore them to confidentiality to avoid posturing. One meeting with a hard-left French labor leader, Philippe Martinez, head of the CGT union, descended into a tense back-and-forth over concerns the government was weakening labor rights, according to Pénicaud, but ultimately resulted in an agreement over gender workplace issues. That France needs to change is undisputed. Despite a mild recovery, unemployment is stuck above 9 percent, more than twice that of Germany. A fifth of young people are out of work, and 40 percent of the jobless stay unemployed for up to two years. At the same time, nearly 330,000 jobs are unfilled as employers scramble to find programmers, plumbers and other experienced workers. France may face a shortfall of 2.2 million highly skilled workers by 2020, according to consulting firm McKinsey & Co.
Tenacious and energetic, she regularly crosses the country visiting small businesses, vocational training centers and unemployment offices. Pénicaud tends to stick to formulaic speech when discussing her plans, an attempt to stay on point with Macron and Prime Minister Édouard Philippe. But when in the negotiating room, her main aim is to strike an accord — she is willing, and able, to make concessions, those who know her say, and she sometimes proffers a pot of ginger tea to smooth the atmosphere. Often a rare woman in a room full of men, she spent over 20 years navigating labor issues as a human resources executive at Danone and Dassault Systèmes, two of France’s biggest companies, where she forged links with union leaders. She burnished her corporate ties as the head of Business France, an agency that lures foreign investment, where she rubbed elbows with business executives, and met Macron, then France’s economy minister. Her opponents argue that she does not relate to the common worker. Wealth and power are flash points for French populism, and Pénicaud, who declared personal holdings of over 7 million euros, or $8.2 million, when she took office, became fodder for critics who accuse Macron of favoring the rich. The image of a labor minister sympathetic to corporate interests hardened when, acting on Macron’s orders, she persuaded lawmakers to pass the business-friendly changes into law by ordinance, a procedure that sidesteps the lengthy Parliamentary process. Critics charged it was a way of ramming through changes with little dissent. Last October, just before the new rules were approved, protesters surrounded a luxe Parisian restaurant where she was scheduled to attend a conference, armed with “Wanted” leaflets bearing her image and pamphlets suggesting that she be hunted down. Scores were arrested after clashing with police and burning cars. There are other issues, dating back to her business career. Pénicaud is being investigated over allegations that she awarded lucrative no-bid contracts to a French publicity firm while she headed Business France. Questions have also been raised about a 1.1 million-euro windfall in 2013 — a result of cashing in Danone stock options — just when the company was announcing the elimination of 900 jobs. It didn’t help when she appeared in a Paris Match magazine spread in June standing in a serene yoga pose at the Hôtel du Châtelet, a gilded 18th-century mansion that serves as France’s labor ministry. The photo went viral, with Twitter users altering it with images of unemployed people. Pénicaud has denied any wrongdoing, and emphasized, in the case of the Danone payout, that she had insisted on receiving equal pay with men who also sat on the board. The government, she insisted, was on the right track. Tens of thousands of new jobs have been created. Foreign investors are coming to France. Yet she acknowledged that if the changes don’t rapidly improve life for ordinary French citizens, the risk of a popular backlash could build. For Pénicaud, that means moving even faster.